It’s been a while since I posted on the specialty insurance sector and I hope to post some more detailed thoughts and analysis when I get the time in the coming months. M&A activity has picked up recently with the XL/AXA and AIG/Validus deals being the latest examples of big insurers bulking up through M&A. Deloitte has an interesting report out on some of the factors behind the increased activity. The graph below shows the trend of the average price to book M&A multiples for P&C insurers. 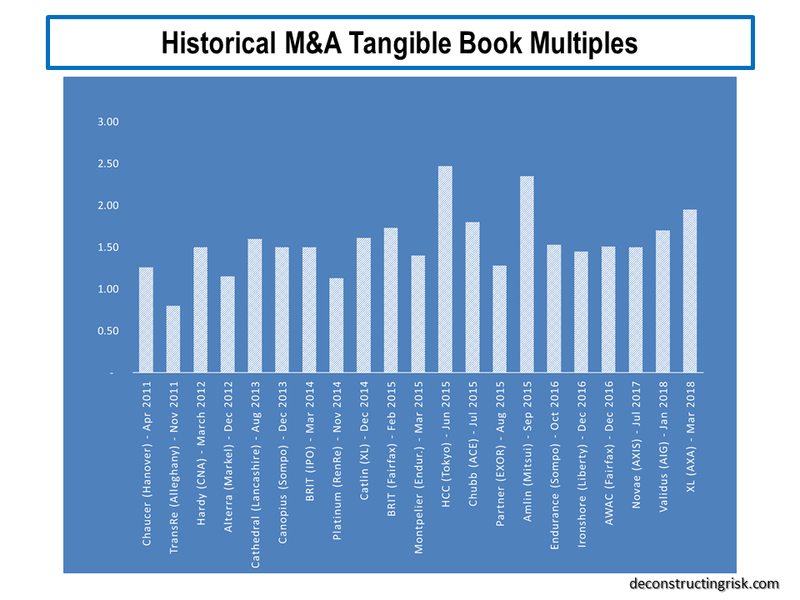 As regular readers will know, my preferred metric is price to tangible book value and the exhibit below shows that the multiples on recent deals are increasing and well above the standard multiple around 1.5X. That said, the prices are not as high as the silly prices of above 2X paid by Japanese insurers in 2015. Not yet anyway! Unless there are major synergies, either on the operating side or on the capital side (which seems to be AXA’s justification for the near 2X multiple on the XL deal), I just can’t see how a 2X multiple is justified in a mature sector. Assuming these firms can earn a 10% return on tangible assets over multiple cycles, a 2X multiple equates to 20X earnings! 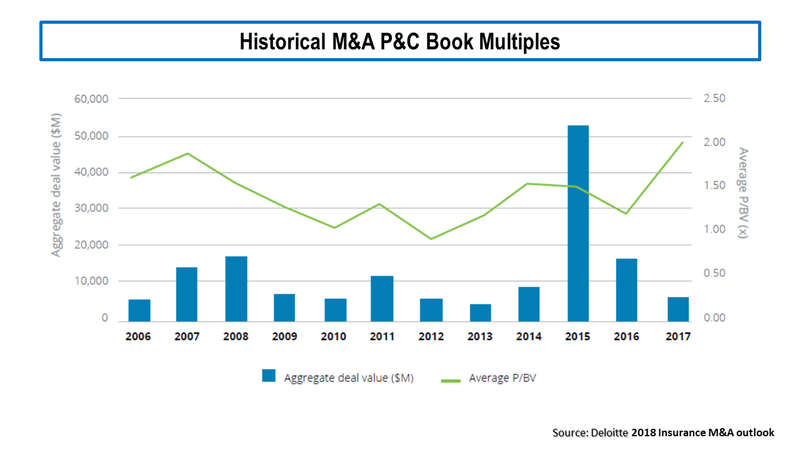 Time will tell who the next M&A target will be…. This entry was posted in Insurance Market and tagged AIG, AXA, bermudian insurers, European reinsurers, insurance M&A action, insurance valuation, London based specialty insurers, london insurance market, M&A premium, price tangible book values, price to book value, price to tangible book value, reinsurance price to tangible book value, reinsurance pricing, reinsurance rates, risk based capital, specialty insurance sector, specialty insurer valuation, tangible book value, total return, Validus, XL Group. Bookmark the permalink. True words! I keep scratching my head what exactly drives AXA to spend significant money for a (re-)insurance co in a still soft market. Acquiring additional assets at too high prices probably won’t help them. If I would hold AXA shares I would think long and hard whether not to sell… We will see how this turns out. My bet is a nice fat goodwill impairment a few years down the road :). Suspect that’s a good bet, can’t see cultures blend, an insurer is simply capital plus it’s people and AXA has just given them a big payday!! Over-generous diversification benefits in Solvency II are a likely driver plus a CEO in a hurry!! There’s still a few quality insurers in London and, well, one in Bermuda so the mania may yet beat the silly multiples of the Japanese!! Hope all good with you, I’ve been too busy of late to post, mainly on sidelines market wise these days, waiting for opportunities, am keeping an eye on credit markets for sign of stress, expect 10 year to test 3% if Fed get the finger out…. Funny… I subscribed for comments or at least I thought so. I blame the fact that I didn’t get noticed on the leprechauns, not on my technical incompetence… anyway. I forgot that Solvency II offers diversification “benefits”… one more reason to buy another insurer in a hurry. My guess is that they will spend the next couple of months checking the long-tail books and years integrating IT systems. Which should be beneficial for other players in the market ;-). Which one is the Bermuda quality insurer? RenRe? I’m doing fine, thanks. Marketwise I keep scratching my head… lighted up on two core positions (BRK and MKL) lately as I fear we might get closer to the end of the current (super)cycle. At least John Hussman rang the bell… long and loud! And I watch HY and IG OAS spreads like a hawk. Don’t disagree Eddie on anything you said, time will tell but no need to fret, there will be better risk/reward dynamics to be had at another time!! !